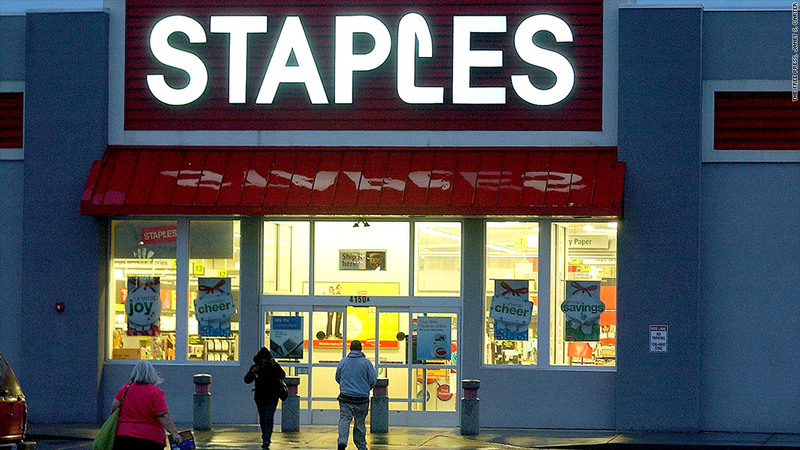 Staples plans to close 225 stores by the middle of 2015. Staples will close 225 stores in North America by the middle of next year as the office supply retailer tries to trim costs in the face of weaker sales. The store closings will come to about 12% of its stores in North America. The closings build upon the 40 stores it closed in the region in 2013. Staples said it is aiming to save $500 million annually through the closings and other cost cutting measures. The announcement comes two days after electronics retailer Radio Shack (RSH) announced plans to close up to 1,100 stores, or about 20% of its locations. Staples also reported lower sales and earnings in its most recent quarter that ended Feb. 1, a period that included the holiday shopping period. And it warned that sales and earnings would be lower again in the current quarter, missing forecasts of analysts. Staples is facing increased competition from Office Depot (ODP), which purchased smaller rival OfficeMax during 2013. The combined operations of the two chains now have more locations in North America than Staples, even though Staples is still larger in terms of sales. Office Depot could be announcing its own store closings in the future as it deals with overlapping locations in the same market produced by the merger. A more serious long-term threat to Staples and other brick-and-mortar retailers is the ever-increasing competition from online retailers such as Amazon (AMZN). Shoppers are likely to engage in a practice known as "showrooming" in which they go to a brick-and-mortar store to look at a product, but then purchase it online, generally at a lower price. In response, Staples is putting more emphasis on its online operation, which it says now generates nearly half of its sales. It ended 2013 with more than 500,000 items offered for sale online,about five times as many as were offered online at the beginning of the year. Online sales grew 10% in the fourth quarter compared to a year earlier, at the same time that sales in its brick-and-mortar stores open at least a year fell 7%. "A year ago, we announced a plan to fundamentally reinvent our company," said Staples CEO Ron Sargent. "We're meeting the changing needs of business customers and taking aggressive action to reduce costs and improve efficiency." Shares of Staples (SPLS) tumbled more than 12% in early trading.